The Prawn Nebula, also known as IC 4628 and Gum 56, is an emission nebula located in the constellation Scorpius. It has an apparent magnitude of 7.31 and lies at a distance of 6,000 light years from Earth. 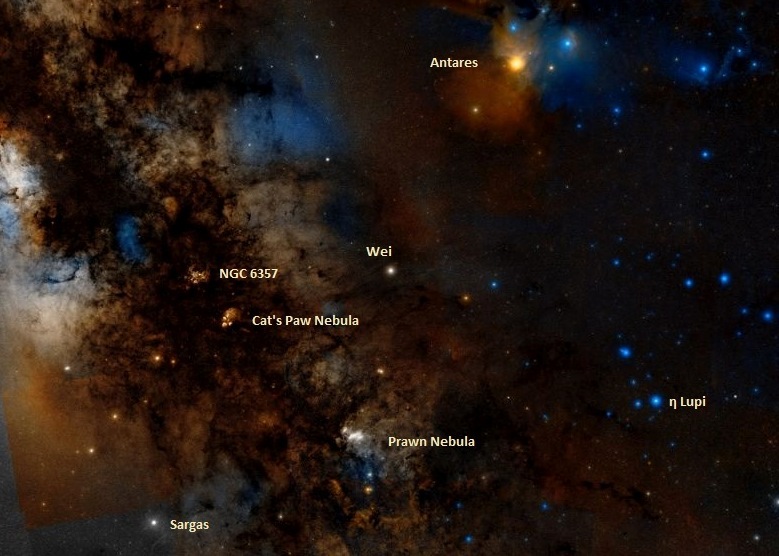 Located to the south of Antares, the nebula is about 250 light years in diameter, corresponding to an apparent size of 1.5 degrees, or 3-4 times the size of the full Moon. The Prawn Nebula was discovered by the American astronomer Edward Emerson Barnard around 1900. It is a stellar nursery that contains a large number of very hot, luminous, young stars, formed out of the surrounding gas. These stars include two large, hot, blue-white giants belonging to the rare spectral class O. O-type stars have a relatively short life span as they tend to burn out very quickly before ending their lives in supernova explosions and collapsing into either neutron stars or black holes. The blue giants in IC 4628 will end their lives after only about a million years. The material produced by their supernova explosions will be used to form new stars in the nebula. The two luminous giants and other young stars in the nebula are responsible for illuminating the surrounding gas. The stars emit an enormous amount of ultraviolet radiation which ionises the hydrogen gas in the nebula, making it glow. 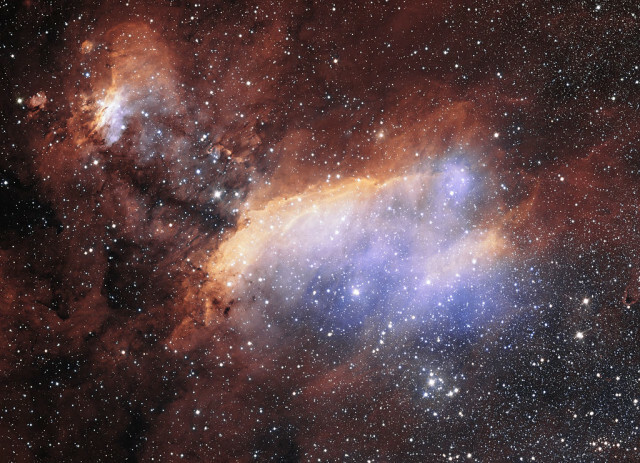 In September 2015, ESO released a detailed new image of Prawn Nebula. The image was taken with the MPG/ESO 2.2-metre telescope using the Wide Field Imager (WFI) camera at the La Silla Observatory in Chile as part of ESO’s Cosmic Gems program. 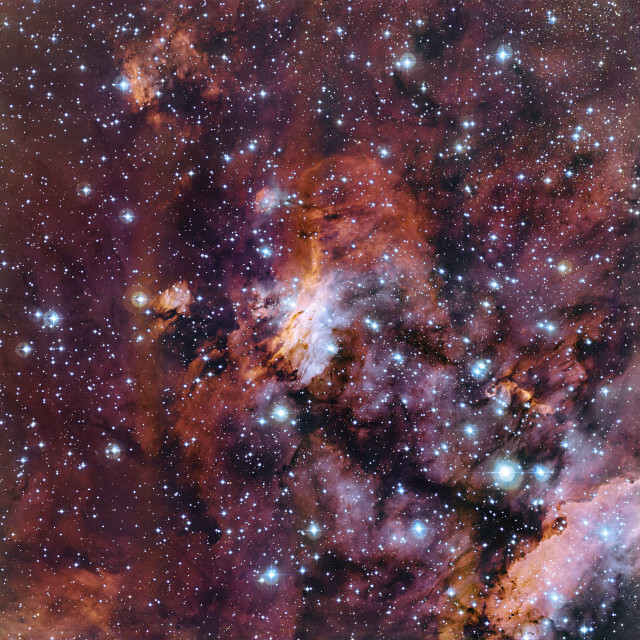 The image reveals a vast star forming region with three clusters of young stars, not more than a few million years old, which illuminate the surrounding clouds. IC 4628 was catalogued as Gum 56 by the Australian astronomer Colin Stanley Gum, who published his catalogue of H II regions in 1955.